This recipe for chewy treats is big on taste but needs little effort. They are handy to make when the weather is hot because the oven never has to be turned on. M&M’s and peanut butter, what could be better. 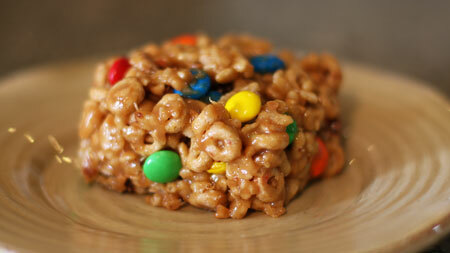 In a large bowl, combine Cheerios, Rice Krispy's cereal, peanuts and M&M's; set aside. In a saucepan, bring corn syrup and sugar to a boil, stirring frequently. Remove from the heat; stir in peanut butter and vanilla. Pour over cereal mixture and toss to coat evenly. Spread into a greased 15x10x1 baking pan. Cool. Cut into bars.